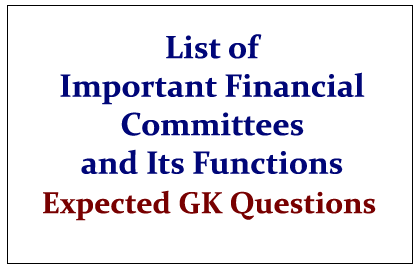 The List of important Financial Committees and its functions were given here below, which is the expected GK Questions in Bank PO and Clerk Exams. Candidates those who are preparing for the examination can use this material. Scrutinize applications for new bank licenses. For comprehensive financial services for small businesses and low-income households. For evaluation of corporate sector participation in Higher Education.